Suit up a frozen pizza for game day with this football-inspired arrangement of pepperoni and sliced cheese. 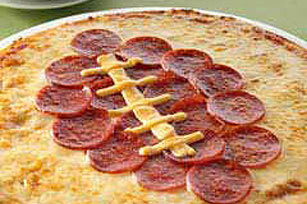 Arrange pepperoni slices in football shape on top of pizza. Arrange Singles strips on center of pepperoni for the football lacings. Serve with a quick bagged salad tossed with your favorite KRAFT Light Dressing. Sprinkle hot baked pizza with KRAFT Grated Parmesan Cheese just before serving.